Bleed Eagles Green: Philadelphia Eagles Blog: Let's Stick to Football, Please! Let's Stick to Football, Please! I understand that Vick needs to conduct community service to repair his image and show remorse for his horrific acts (I still question how genuine the remorse truly is). But as a fan I am tired of seeing headlines about the Eagles working with animal rights groups and Vick conducting speeches at local high schools. I want news on Eagles football. As a fan I only care about what happens between the white lines or off-the-field matters that have an impact on the success of the Eagles (injuries, roster moves, interviews). 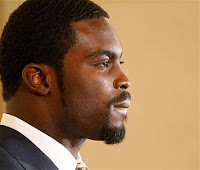 But since Vick is an Eagle the off-the-field news will be as heavy as anything that Vick does on the field this season. Here's hoping the McNabb and the offense light it up against the Panthers and Saints. Keep the need for Vick to a minimal.